Entertainment and Cultural Enterprise Management: An Account of Its Becoming | Kam-Au Amen & Co. 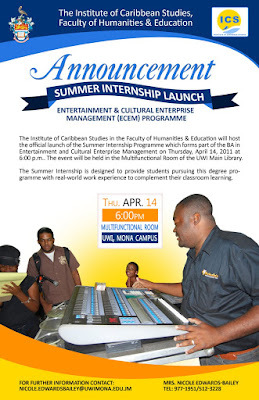 This short version of the development of the bachelor of arts degree in Entertainment and Cultural Enterprise Management (ECEM) at the University of the West Indies, UWI, Mona should have been told long ago. It is entirely my fault because there has been many a word of encouragement from Professor Carolyn Cooper to write it, and in fact her suggestion is that I should use the experience to pursue my PhD. That I am not currently a PhD holder in the first place is also entirely my choice as in fact I was a candidate with a full scholarship in the University of the West Indies (UWI) Cultural Studies PhD program. I opted out, taking the MPhil instead, I think much to the displeasure of the then Director of the Institute of Caribbean Studies. One factor that went into my decision was that I had always maintained that I did not want to pursue a career in academia. Perhaps that was shortsighted, but I felt I was being true to myself. I had seen the promise of black liberation in the culture business and so my mind was made up that I was going to pursue my masters in entertainment business, even if it sent me to the grave; well I did, a few years later. The story of the present ECEM bachelor's degree began in this period of my life. In November 1999 I attended the inaugural Caribbean Music Expo (CME) meeting in Ocho Rios. It was there, while listening to the grouses of Jamaican and Caribbean music sector players about the lack of support for them that the idea of offering training support for the sector began to stir in my thoughts. I asked myself the question why didn't the UWI have a program that prepared personnel for this sector, which on the surface was so definitive of what it meant to be Jamaican or Caribbean. It was shortly after my return that on a casual ride on my bicycle I ran into Prof Carolyn Cooper. In conversation I posed the question to her about the absence of a program at the UWI to service the entertainment industry. "Den why yuh nuh develop suppen", was her response. As it turned out that was all I needed. I immediately set about researching similar degree programs from other universities. My main inspiration was to come from NYU's Entertainment, Media and Technology program, which had both a MBA and an undergraduate component. I also looked at other US university programs such as Columbia University and a few in the UK. I must confess that at the time there was not the many that exist now from which I could draw. I enlisted the support of Mrs. Carolyn Hayle who was then the Special Programmes Coordinator at UWI - presently Dr Carolyn Hayle is the Executive Director of HEART/Trust NTA. Mrs. Hayle was extremely supportive and allowed me her time and access to resources that would have otherwise been difficult to obtain. My initial approach was to use the model that had been followed for the then two year old African and African Diaspora Studies major, assembled by Profs Maureen Warner-Lewis and Rupert Lewis. Essentially, they sought to bring together existing African and Diaspora courses within the UWI system to offer the concentration. The program has been a success and I am proud to stand as its first graduate. This precedent was to serve the ECEM initiative well. I was able to comb through courses that were offered at all the UWI's then three campuses (Cave Hill, Mona and St. Augustine). This was important because it meant that if a course that could serve the ECEM program was already on the books in Cave Hill or St. Augustine, then on the surface the hurdle of course approval was already behind us. Therefore the major concern would become provision for its delivery at Mona. Much to my surprise I found a fair number of courses on both campuses that would have been beneficial, some of which did not make their way to Mona. Nevertheless, the innovative ECEM degree still remains a respectable offering. The specific goals are to produce graduates who will become innovative business and industry leaders. A major focus of the programme is entrepreneurial development and innovation. Graduates will have gained a full appreciation of the importance of the convergence of media, computer based technology and culture within the global context and be prepared to harness their benefits for the Caribbean. These goals were not arrived at arbitrarily, but were informed by articulated sector needs. Up to that point scholars such as economist Dr Keith Nurse, first operating out of UWI St. Augustine, and now Cave Hill had done commissioned research on the way forward for some of the Caribbean entertainment sectors. Lloyd Stanbury and Andrea Davis were also among those who had put out work on this subject. UNCTAD, WIPO, JAMPRO, TIDCO and the Caribbean Export Development Agency are some of the funders for some of these studies, the results of which remain shelved waiting on an elusive government buy-in. After more than ten years many regional governments have still not moved to take these sectors seriously. With the benefit of hindsight one is forced to acknowledge that conducting the research for presentation to government representatives has failed miserably. We have little meaningful progress to show for it. It would appear then that the current approach needs review albeit the research is necessary. To put this in context it should be understood that the ECEM program was deliberately focused away from a reliance on government, and what they should do, towards the very broad scope of the capitalist entertainment enterprise; and this ought to be seen as a significant break in the focus of cultural studies as it was then practiced at Mona. Cultural studies had hardly engaged business except to critique the underlying assumptions of its practice. 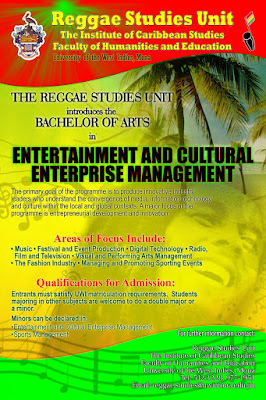 Evidence of this can be seen with the more traditional arts oriented content of the Post Graduate Diploma in Arts and Cultural Enterprise Management developed virtually in parallel (not known to me until months after I had gone through a few drafts) that is offered at the Department of Creative and Festival Arts at UWI, St. Augustine campus. A dynamic leader and innovator within the entertainment and culture industries. A highly self-motivated entrepreneur and product manager. A balanced dynamic leader/entrepreneur who understands and is appreciative of both the Caribbean cultural context, as well as, the business of culture industries regionally and globally. An individual who is capable of creative application of the knowledge of technicalities within his/her specialization. A sensitive presenter of the culture, who eschews demeaning and insensitively commoditizing the product. Upon completion of my first draft the offering was designed and laid out with the options of a special (four years) and a major (three years). However, the powers that be suggested the option of the major for moving forward, as the university had by that time decided that they were moving away from offering specials. By far the approval stage of bringing this program to reality proved to be the most difficult part of the task. By March 2000 (approximately three months after the idea had been born) I had a first draft of the program ready for presentation to the powers that be. The program as initially designed would have best found a home in the Faculty of Social Sciences at Mona. This was so primarily because many of the existing courses were to be found in the Departments of Management Studies at Cave Hill, Mona and St. Augustine. It was in fact designed as an entrepreneurial business management degree. The Humanities courses were drawn from the Caribbean Institute of Media and Communication (CARIMAC), the creative arts (CA coded) and two general arts (AR coded) courses. It is useful to mention here that since there was a need to develop some specific courses, any department that took the program on board would have effectively become owner given that they would own the courses as coded, at least for the moment. Unfortunately, this was a fact that never helped us in the early stages. My first approach was to present the draft to the head of my department, the Institute of Caribbean Studies who happened to also be the Dean of the Faculty of Humanities and Education. He lauded the effort but in a frank response he said he would not pursue it in the faculty because of a prior experience with one major they developed that ended up in the Faculty of the Social Sciences. He graciously suggested I present the draft to the then Dean of the Faculty of Social Sciences, the late Prof Barry Chevannes. A meeting was arranged with his assistance. Both deans, Prof Cooper, Mrs Hayle, and I attended that meeting. Prof Chevannes welcomed the initiative and was seemingly excited about the prospect but as he explained it would require a department to take it on board. He sent us on to meet with the then Head of the Department of Management Studies, Prof Alvin Wint, who made a lasting contribution to the name of the program. He suggested the insertion of the word "enterprise" rather than "industry", indicating a focus on the units of economic activity rather than their collective output. 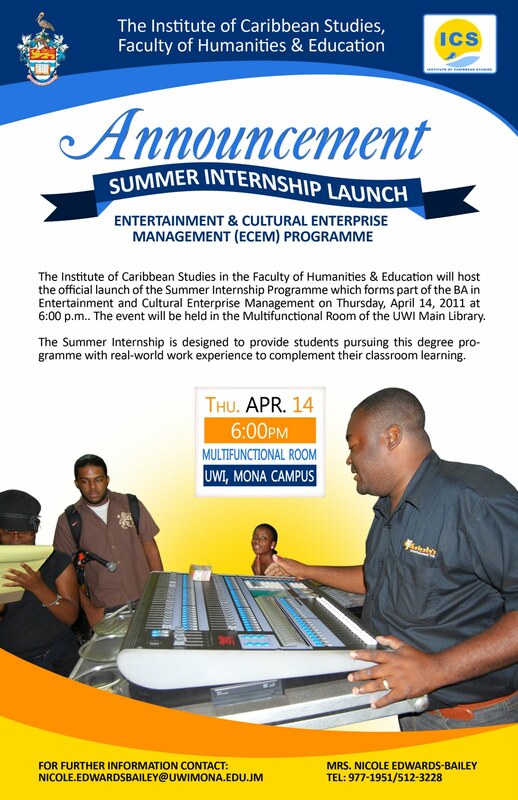 Up to that point the initiative was called the "Programme in Caribbean Entertainment and Culture Industries Development and Management", a name that I am sure most will agree was very unwieldy. From the survey done on the Mona campus offerings, one is yet to find a course that speaks directly to entrepreneurial development and innovation. The focus has overwhelmingly been on product management, rather than product “creation”, harnessing and development. One cannot emphasize enough that it is of prime importance that this programme gives focus to issues such as new venture creation, financing new ventures and the science of successful entrepreneurial practice. Subsequent to this suggestion the course Entrepreneurship and New Venture Creation was introduced at the Mona campus for summer 2001. It was also satisfying to see that in 2008 the Department of Management Studies began to offer a minor in Entrepreneurship. In October 2001 I left the UWI to begin my job at the Ministry of Culture as Coordinator of the Culture in Education Program, a post I held until July 2003 and subsequently on to the VTDI as Lecturer/Coordinator of their very own Entertainment and Events Management diploma until October 2004. I followed that up by becoming the Program Manager for the CARIFORUM Cultural Support Fund until November 2005. By the time 2005 arrived, Prof Cooper and I had agreed that a BSc via the Faculty of Social Sciences was not likely to materialize and so she felt it best to move the program forward under the Reggae Studies Unit in the Faculty of Humanities and Education given that this was a unit that she coordinated. As it turned out Reggae Studies was to be the program's mother and Prof Cooper the mid-wife. Of course, I was the willing baby-father. Up to that time, I had earned my own stripes within the cut and thrust of the sector through my jobs and had attended my fair share of meetings and business development initiatives that got their funding from the government, non-profits and international development agencies. Not least of all was my stint at VTDI in developing courses, coordinating their new diploma and a sustained set of entertainment business professional development courses. With the wind of these real world experiences to back me I expanded the plan for the Entertainment and Cultural Enterprise Management initiative. The program was now associating specifically with the Reggae Studies Unit and started to include the Post Graduate Diploma mentioned earlier as a offering here at Mona, through a partnership with the Phillip Sherlock Centre for the Creative Arts, a series of short courses designed specifically for the music sector, the delivery of consultancy services for the entertainment sectors, as well as the BA program. In May 2005 a whole set of meetings began at the University of the West Indies and this time the players were different. The tourism interests had come to the table. In April 2006, the tourism concentration in the Department of Management Studies, Mona asked for my help in developing the course that is now Entertainment Management and offering it to their finalizing students. Work on the outline began initially with the help of Mr Wayne Wright who was then the Music Business Consultant at JAMPRO. The course was approved and with much behind the scenes anxiety I began delivery in September 2006; it was show time! Fast forward to November 2007 and I was ecstatic when the second cohort of students in this course successfully mounted the inaugural Entertainment Expo. The video below captured a few moments from this historic event. Inaugural Entertainment Expo, November 2007, UWI, Mona. a specific survey course possibly titled “Caribbean Entertainment and Culture Industries”, which gives the historical development and introduces theories of the specific entertainment and culture industries that are the subject of the program’s focus. a course examining the legal issues within Caribbean entertainment. a course to be named The Business of Producing Culture: Event, Festivals, Music and Film. the inclusion of an internship. All these have been achieved with the exception of number four. In fact, to date other courses have made their way to the books, namely Entertainment Business Law; Entertainment and the Digital Convergence; Fashion, Culture and Development; and Creative Industries Marketing. With tourism expressing its interest with a patently clear tourism agenda Prof Cooper and I realized we needed another game plan. I was very clear about what the objective of the program was and it could not have been subsumed under a tourism umbrella. Ultimately, we negotiated a minor that would suit the tourism interests, while we began to look elsewhere for institutional support. In August 2006 CARIMAC became our next stop. 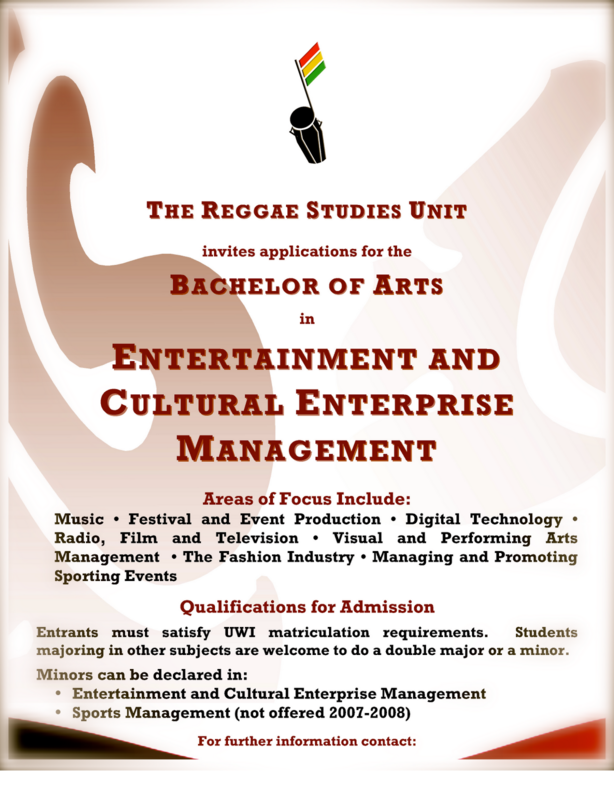 In spite of my expanded 2005 Entertainment and Cultural Enterprise Management initiative that was centered around three distinct entertainment industry empowerment projects in the Reggae Studies Unit, we still made the effort to bring other departments on board. In retrospect, these overtures must be ranked among the most selfless that I have undertaken in my time. In my generosity I passed on the entire program and the foundation course I had developed so that CARIMAC would have pursed approval and taken the program as one of their offerings. Though we had cordial meetings to help this process along we were not successful in having them bring the program to light. The conclusion then was to go it alone using the Reggae Studies Unit as the base. It worked. Prof Cooper had managed to get the succeeding Dean, the late Prof Aggrey Brown interested and in turn he began to throw the weight of his office behind it. With the help of Dr Camille Bell-Hutchinson, then Deputy Dean, the program would ultimately gain approval in July 2007 after many meetings. The program began with twenty-one students in its first intake in September 2007. It was an exciting process and I had a hand in the selection of them all. There were many who wanted in but could not have been accommodated. Selecting the 2008 intake was even more difficult. My colleagues and I were amazed at the outstanding academic strength many of the applicants had. The Faculty of Humanities and Education had found a new winner. Many who were prime candidates for UWI’s prestigious law program, with excellent grades in nine Ordinary Level subjects and Advanced Levels pending, were opting to do the ECEM as their first option, and many very good ones had to be turned down. The writing was on the wall and the program was going to be a contender if it lived up to its promise. As fate would have it I chose to exit the program at the end of July 2008 despite Prof Cooper's counsel to stay on. But this was not before I had ensured that even more courses had been written and approved. In my mind the foundation was laid and so it was time for me to be on my way to answer the call of my dreams. In 2010, the ECEM major put out its first set of graduates. I was not on hand to witness this but it must have been a moment like few others for those who attended that inaugural graduation ceremony and fully comprehended the arduous journey. Finally, the sacrifices had shown themselves to be well worth it, and I am eternally grateful for the opportunity to have made this bit of history in the exemplary spirit of Marcus Garvey. I am proud of the fact that, because of my initiative, these graduates had been given an opportunity to pursue their dreams.